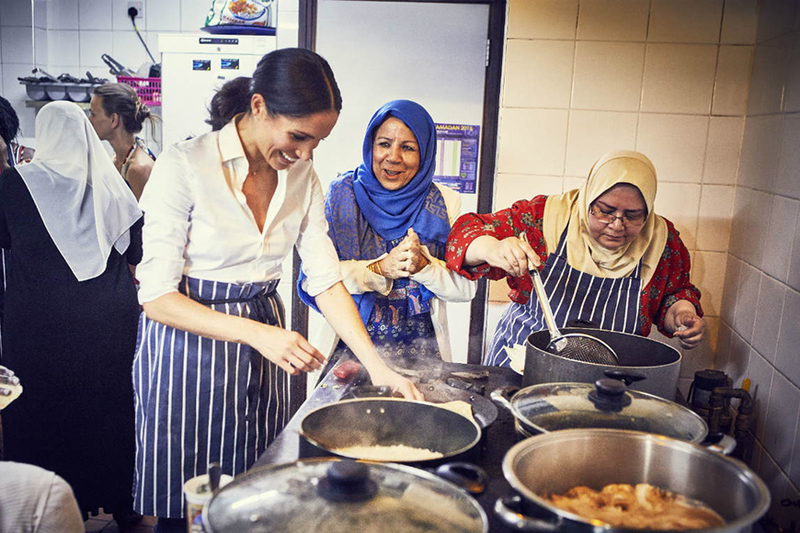 ‘Together: Our Community Kitchen’ showcases over 50 recipes from women whose community was affected by the Grenfell Tower fire –the Duchess of Sussex is supporting the new charity cookbook. The Duchess of Sussex used to share her love of food through her lifestyle blog ‘The Tig’ and on Instagram, but since becoming a royal, Meghan has deleted her social media accounts and, therefore, all traces of her foodie lifestyle. Yet, for her first solo project as a member of the royal family, Kensington Palace has announced that Meghan Markle worked on a charity cookbook called ‘Together: Our Community Kitchen,’ which celebrates the power of cooking to bring people together. Last summer in West London, a group of women who had been affected by the Grenfell fire gathered to cook for their friends and family at the Al-Manaar Muslim Cultural Heritage Centre. The women began to connect as a community, cooking together and sharing recipes –as more and more women started to join in, the Hubb Community Kitchen was born, Hubb meaning love in Arabic. Ever since then, Meghan Markle has continued to visit the kitchen, inspired by the women and the community, as she championed a cookbook project to help fund the kitchen, with all proceeds going back to the Hubb and the wider community. The cookbook supported by the Duchess of Sussex will go on sale from 25th September, and features a three-page foreword from the Duchess. It also showcases the recipes from Europe, the Middle East, North Africa and the Eastern Mediterranean, all written and cooked by the women of the Hubb Community Kitchen.